Every now and then the military has been having stealth bombers fly on a low level practice bombing run flight path the goes directly over my home about once a month. On this day I went out to take some pictures of the bomber as it flew over my home to show on my social media page. I had taken many pictures that day but on the last pass I took 3 pictures in rapid succession. The time period took about 3 seconds. 1 second per picture on my cell phone. Picture 1 had the bomber only in it. 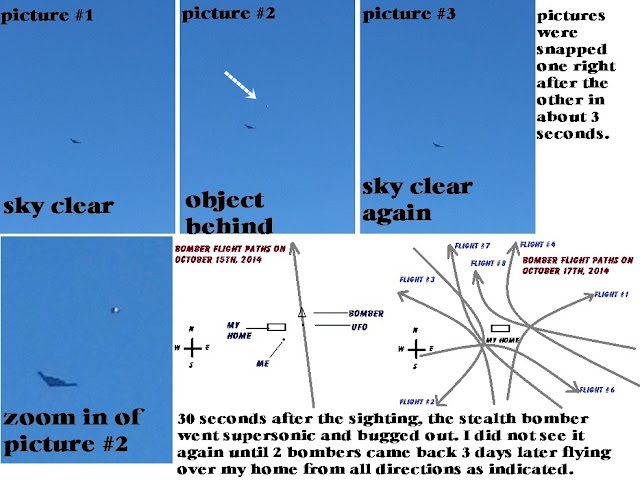 Picture 2 had something behind the bomber. It looked like a small craft roughly about 1/10th the size of the bomber. It was black in color and there looked to be a white light on the back end which to me suggested a exhaust or flame. Picture 3 only had the bomber in it once more. The other craft was gone. 30 seconds later as the bomber turned to the west I heard it go supersonic and it broke the sound barrier. They had never done that before on their practice runs. That was the only time. 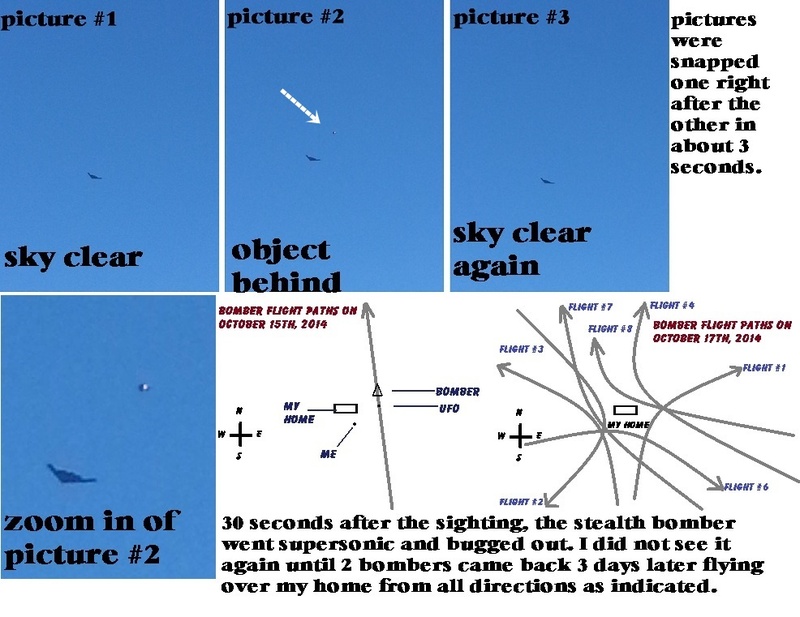 3 days later 2 bombers returned and did around 7 or 8 low level flights using my home it seemed as a center point where they would turn and fly off into another direction. Each flight run came from different directions that day. They did not fly on their normal practice pattern. I compiled the pictures and have enclosed them. The image below shows the sequence of the pictures and the event. I have had 4 more sightings of different craft since but all were too far away for my cell phone to pick them up. One shaped like a missile. All white with small square wings on the tail only. One that was just one light in the night sky that met up with a 2nd which was stationary and I thought was a star till it flew off in another directing meeting up with a third that did the same thing. Image of a stealth bomber. One that flew directly over my home that have 8 barely visible gray lights in a straight line. Not one after the other but side by side. One was a formation that I thought was a flock of birds but they flew in too perfect of a formation and when I looked at them in binoculars I could see they were all v shaped craft. White, gray and black in color. I do have each event documented down in a log book I started. Mufon case 67994 – 11/7/2015. 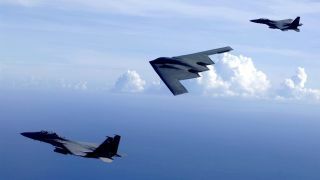 The Stealth Bomber is not capable of flying supersonic, so if you saw one do so, then it is a "fake plane," which are being seen more often and are associated with UFO's in general. 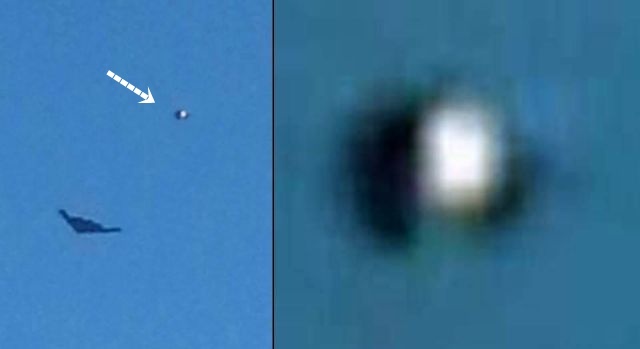 Also take note of the shape of many UFO's that are not saucers, flying wings or aircraft like objects but are composed of white ovals connected to black circles, in varying configurations, like this one you recorded. what makes you Think that they cannot, or Do Not? Just because you do not your self visually see them doing so?